Jeremiah 29:11-14 "For I know the plans I have for you," declares the Lord, "plans to prosper you and not to harm you, plans to give you hope and a future. Then you will call upon me and come and pray to me, and I will listen to you. You will seek me and find me when you seek me with all you heart. I will be found by you," declares the Lord, "and I will bring you back... to the place from which I carried you into exile." 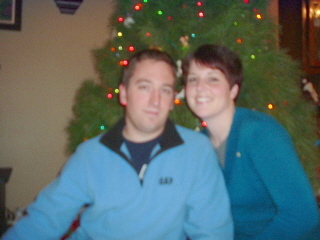 This picture was taken of Mike and Amy at Christmas 2005. This picture was taken of Mike and Amy at Christmas 2006. The year 2006 holds many emotions for me. I can remember last year at this time, I looked forward to saying good bye to the year 2005. I had my last surgery on December 28, 2005 and I got the phone call from my surgeon saying that they had achieved clear margins, meaning they had removed any cancer that remained in me. 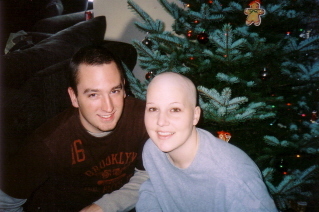 2006 would be a brand new year, a cancer free year for me. Although my treatments would continue until spring, I had a new sense of renewal. Jeff and I had prayed that we would be able to celebrate our healing together in the new year. In January, I sang my first duet with him at the church he attended. Before we sang, we both gave our testimonies to the congregation of what God had done for us and what He was continuing to do. I was so nervous to sing that night. It had been years since I had been up in front of anyone like that. I know that Jeff was more nervous for me than he was for himself. Looking back, I know that was probably how he felt as we went through treatments. I know he prayed just as hard for me as I did for him. It has been extremely difficult for me to know that in the physical sense here on earth, I got better and he did not. He was obedient to everything God asked of him. "For I know the plans I have for you," declares the Lord, "plans to prosper you and not to harm you, plans to give you hope and a future." (Jeremiah 29:11) I have to keep telling myself that this was God's promise to Jeff just like it is for me and for you. Jeff's passing was his reward, not his punishment. In the Christmas season of 2005, I looked forward to Christmas 2006. I wanted to be done with chemotherapy and radiation, surgeries and needles, IVs and hospitals. I wanted my hair to grow back, and to be finished wearing hats. I wanted to have eyelashes and to be able to do my makeup again. At the time, I was ready to say good bye to 2005. I had no idea that in 2006, I would have to say good bye to my brother in this life. My strongest bond with Jeff was formed in the last year of his life. When I was diagnosed with breast cancer in September of 2005, I could not think of a single reason why I would have to go through what I was about to go through. I dreaded telling my parents that another one of their children was about to start chemotherapy. I know now that my sickness was part of God's plan. He did not cause me to be ill, but He did allow it for awhile. I trust that God's plan will continue to work things out for good, giving us hope and a future. I miss Jeff, there isn't a day that goes by that I don't think about him and just try to imagine the things that he has seen these last few months. The events of the summer of 2006 play over and over in my head. I remember every time that I saw him, the things he said, the jokes he told. For everyday I have been overwhelmed with sadness and cried for him , I know that he has not cried, and that brings me comfort. When I think of him now, I picture him as he looked on the homepage of this website. He always has that smile, and I know he is happy. I know he is so excited for our family to be reunited one day in Heaven. I honestly believe that Emily's arrival on Jeff's birthday was only by God's hand. I know that our family's legacy and our story was not meant to end in death, and to help prove it to us, God has given us a new life, He has given us hope. So, as I sit here, one year to the day that I was medically freed from cancer, I am declaring it for Jeff and myself. He too was freed from cancer this year. It was not the way we prayed for, but he was healed nonetheless. God's plan for Jeff was different than His plan for me. Both plans, however, were meant to prosper us and not to harm us, plans to give us hope and a future. Even Jeff's passing was not meant for harm. It was meant to make us stronger, and of more sound faith. That is the outlook I will have for 2007. Hair or no hair, hats or no hats, my faith is intact. This will be the healthiest beginning to a new year I have ever had!